Gizile follows her mysterious teacher, Tok, as they look into the ice of an ocean pool to contemplate a series of strange and mystical visions. Book 1 of the Splashdown science fiction and fantasy series, short-story compilation for all ages. aqua (n) – water, used in compound names, or substances in water. synthesis (n) – The combining of elements into a unified entity. 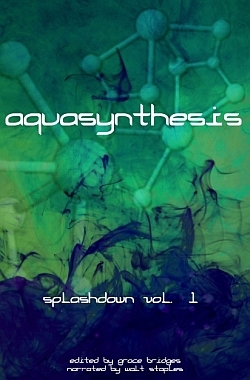 aquasynthesis (n) – a combining of worlds within a pool of water; an anthology of short stories from Splashdown authors. Dive into the creations of the Splashdown wordsmiths. Visit the edges of story worlds you love already, and taste their delights if you are new to Splashdown’s universe. Book 1 of the Splashdown science fiction and fantasy series, short-story compilation for all ages.